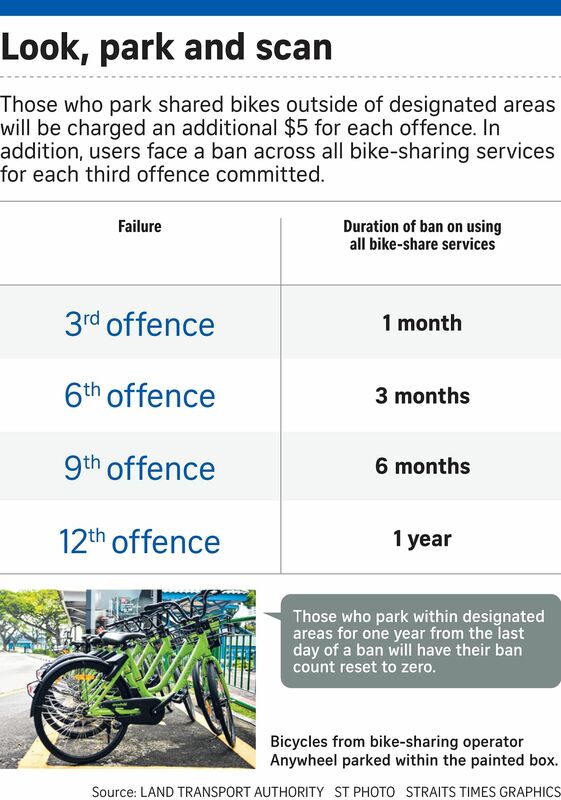 From Jan 14, people who park shared bicycles outside of designated parking areas will be charged $5 on top of the rental amount, while repeat offenders could face bans of up to a year from using such services as part of efforts to stamp out indiscriminate parking. The Land Transport Authority (LTA) said yesterday that users will not only have to lock the bikes, but also scan a quick response (QR) code at these parking areas to end their journeys. The $5 charge is in addition to the fares paid for the trip. For example, a 30-minute ride on an SG Bike bicycle costs $1. Users who park one of its two-wheelers indiscriminately will be charged $6 in total. Those who park shared bikes outside of designated parking areas three or more times within a year will be banned from all bike-sharing services. Depending on the number of offences, this ban will range from a month to a year. "This is part of the new bicycle-sharing licensing regime to encourage responsible parking habits and manage the disamenities brought about by indiscriminate parking of shared bicycles," the LTA said. Between May last year and January this year, the LTA issued more than 2,000 removal notices for indiscriminately parked shared bicycles and impounded 341 of them. The use of QR codes to regulate the indiscriminate parking of shared bicycles was first announced in March. The QR codes can be found at all public bicycle parking areas, including yellow boxes and bicycle parking racks. These currently number around 211,000 islandwide, a number the authorities expect to increase to 267,000 by 2020. Users who encounter damaged or missing QR codes can send a photo to operators via an option in the app and not face the $5 charge. The operators will then assess if the complaints are genuine. Those who park outside of designated areas will receive a prompt on their app, reminding them to park in the allotted areas. Today, SG Bike and Anywheel will roll out a pilot version of the QR code scanning feature on their apps to allow users to familiarise themselves with the process. There will be no additional $5 charge during this beta period. There are currently six licensed bike-sharing operators here - Anywheel, GrabCycle, Mobike, ofo, Qiqi Zhixiang and SG Bike - which are allowed to operate a combined fleet of 40,500 bicycles. SG Bike marketing director Benjamin Oh said that while some users may be confused about the additional steps required to end a journey on their bicycles, the move was beneficial as "users won't need to search for bikes since they will be parked in these areas".